I’ve had kids in the home for twenty-four years. I’ve been writing (working) from home for twenty years. So everything I’ve accomplished as an author has been with kids at home. My kids help me in with my work—they really do. They give me material to write about. I don’t know what I would write about if I didn’t have them! The important thing isn’t the amount of help that your kids actually do, but instead that they feel as if they’re a part of it. Because someday, when they get older, their ideas, work, and help will be valuable! Talking to the kids about my work/books and asking for suggestions. Getting them involved in “work” tasks, such as opening the mail. Letting them know they “why” behind what we’re doing. For example, I’m taking them to Nashville for a work trip. Yes, they’ll be able to see their cousins, but I’m going to do better at explaining what type of work Mommy will be doing while they’re playing. With my older three kids they grew up understanding that servicing others through work and service was something we all did together. I’m excited to teach my younger kids the same! How about you? 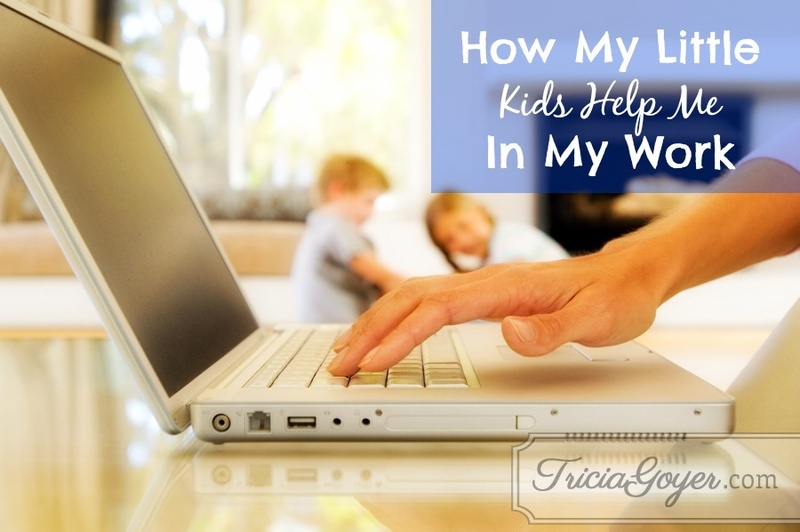 How do you involve your kids in your work? Dear Lord, help me to look at each opportunity as a chance to involve my kids in my work and my day. Help them to learn from me, and help me to be a good example to my children. In Jesus’ name, amen. I’m a Work-at-Home Mommy—You Can Too! Love Alyssa’s idea. Ever think about writing kids’ stories? You’ve got a gold mine of inspiration, there! My name is Caitlin, and I’m one of Tricia’s assistants. I’m guessing it’s your browser; you might try using a different browser or making sure your zoom settings are set to 100%. Everything looks ok on our end!